The handbook speaks to everything student writers need. Even the most popular search engines can’t give students the confidence that comes with a comprehensive, everything-in-one-place resource. A Canadian Writer’s Reference supports students as they compose for different purposes and audiences and in a variety of genres and as they collaborate, revise, conduct research, document sources, format their writing, and edit for clarity. It’s easy to use and easy to understand. The explanations in A Canadian Writer’s Reference are brief, accessible, and illustrated by examples. The book’s many charts, checklists, tabs, menus, and directories are designed to help users find what they need quickly. And the user-friendly index includes both expert (coherence, ellipsis) and nonexpert (flow, dots) terminology. It’s coherent, authoritative, and trustworthy. Writing-related resources on the Web offer information, but they don’t offer instruction. With the eighth edition of A Canadian Writer’s Reference, students have reference content that has been class-tested by literally millions of students and instructors. A Canadian Writer’s Reference is easy to use and easy to understand. The handbook’s explanations are brief, accessible, and illustrated by examples, most by student writers. Boxes, charts, checklists, and menus are designed to help users find what they need quickly. Instruction and examples reflect Canadian culture and conventions. It provides authoritative, trustworthy instruction. Most writing resources on the Web offer information, but they don’t offer instruction. 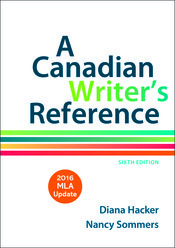 With the seventh edition of A Canadian Writer’s Reference, students have reference content that has been class-tested by students and instructors. Users who loved the new Writing Guides in the sixth edition will be pleased to know they are still here in the seventh. It is available as an affordable e-book that matches the print book page for page and provides students with the ability to read, highlight, take notes, search, and share. It comes with the unparalleled service and support you have come to expect from Bedford/St. Martin’s. We provide professional resources, professional development workshops, training for digital tools, quick, personal service when you need it, and so much more.A Canadian Writer’s Reference is easy to use and easy to understand. The handbook’s explanations are brief, accessible, and illustrated by examples, most by student writers. Boxes, charts, checklists, and menus are designed to help users find what they need quickly. Instruction and examples reflect Canadian culture and conventions. It provides authoritative, trustworthy instruction. Most writing resources on the Web offer information, but they don’t offer instruction. With the seventh edition of A Canadian Writer’s Reference, students have reference content that has been class-tested by students and instructors. Users who loved the new Writing Guides in the sixth edition will be pleased to know they are still here in the seventh. It is available as an affordable e-book that matches the print book page for page and provides students with the ability to read, highlight, take notes, search, and share. It comes with the unparalleled service and support you have come to expect from Bedford/St. Martin’s. We provide professional resources, professional development workshops, training for digital tools, quick, personal service when you need it, and so much more.